In this groundbreaking work, Dr. Phil challenges you to find your 'authentic self' -- that person you have always wanted to be, but were too distracted, busy, or scared to become. Instead, you have created a 'fictional self' -- taking on the identity of who you believe you are supposed be. The incongruence between these two selves is what leads you to feel that your life is incomplete, unbalanced, and more difficult than it should be. In Self Matters, Dr. Phil helps you to demystify your self-concept, and learn how to reclaim your authentic self. You can learn to think beyond the excuses and fears that have masked the person you want to be. By facing the cards life has dealt you, you can relearn how to best react to them. Self Matters is one of the most forward-thinking works on self-concept and self-esteem ever published. We get only one chance in this world. Dr. Phil shows all how to make the most of it. Its a life changing book. I will recommend it to other people. This is a book for a person who is ready to take charge of his or her life and who is tired of living with no purpose. This was a review of Psychology 101. I would not recommend this to a friend. This was the abridged version??? Dr. Phil could do with a new editor. 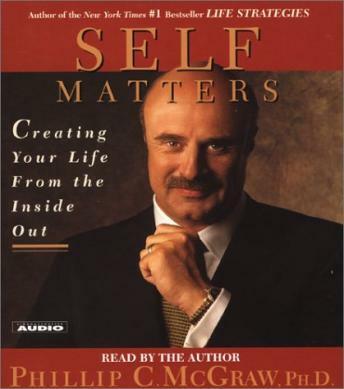 The first CD is devoted to Dr. Phil promoting this book. Skip the first CD. Once you are into the meat and potatoes it's worth a listen. After many years of therapy and 12 step meetings this book lays out a nice plan for those who wish to examine their lives but without the assistance of a therapist, guru, director. Your private journal is the objective person. I enjoyed the book immensely. Dr. Phil, how do you do it? You should be taught in every high school and college... a course that should be a must for anyone going through a life they know could be better, but just don't know how to get it right.